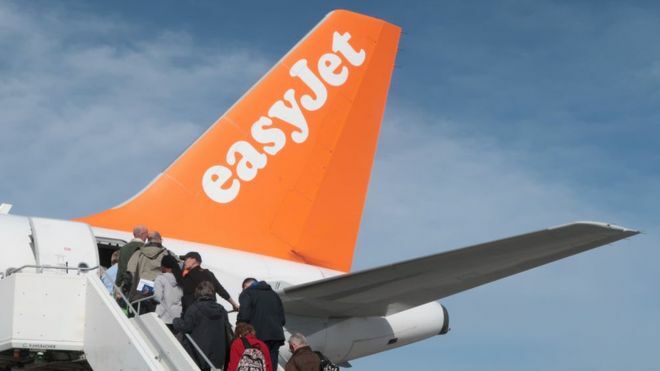 EasyJet says it saw record passenger numbers over the summer and predicts strong annual profits. The airline said it carried 24.1 million passengers during the three months to the end of September, with 95.6% of seats filled. EasyJet added that its profits for the financial year to 30 September were expected to be between £405m and £410m, at the upper end of estimates. This was "a good performance" in a "rapidly evolving" market, it said. Easyjet chief executive Carolyn McCall said: "EasyJet has finished the year with continued positive momentum, delivering both a strong final quarter and a strong second half. "Passenger numbers and load factor in the final quarter set new records and the second half profit was over £100m higher than summer 2016."